"In some quarters there has been ruinous neglect on the part of parents in making their homes attractive to their children. A well-ordered, lovely home, in which peace and good-will prevail is a place of perpetual delight to those who reside there, whether old or young. Where such homes exist the young who live there are not found loafing at street corners or stores, nor spending their time in gadding about from house to house and in improper company at late hours. Books and musical instruments are now so cheap as to be within the reach of the most humble. By furnishing means of instruction, amusement, and enjoyment at home parents can . . . tie their children to them by bonds of affection that can never be broken. In after years those children will think of that home as the brightest and dearest spot in their memories; in their minds it will always be surrounded by a heavenly halo." These pictures are some of the original or replications of houses that John Taylor had owned or lived in after his calling as an Apostle and then Prophet. John Taylor worked in several trades and industries, including a cooper, a Methodist preacher (before joining the LDS Church) and a cabinet maker. During his apostleship, John Taylor also worked as a printer, a newspaper publisher, a territorial judge and a state legislator. 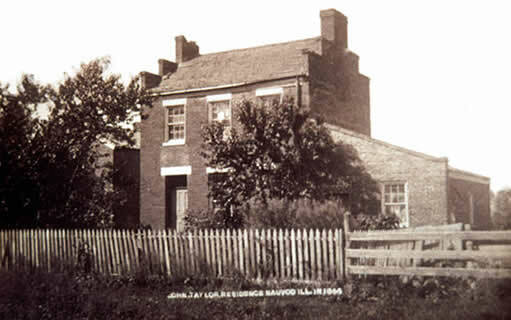 In 1845, John Taylor bought this house in Nauvoo from John Ivins. He and his family would live there for less than a year before leaving Nauvoo in the exodus to the Salt Lake Valley in 1846. 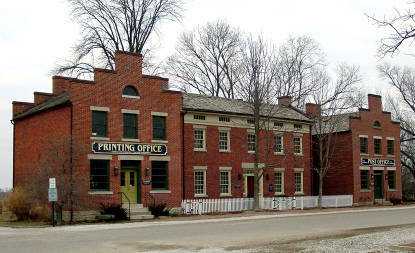 The house was originally connected to two other buildings, the post office and a printing office. A restoration of the house includes the two extra buildings. Years earlier when the Taylors first arrived in Nauvoo with the Mormon refugees from Missouri, the family lived in an old army barracks. After John Taylor returned to Nauvoo from his mission to Europe, he built his family a log cabin to live in. That site is now an empty field with a monument marking the property. John Taylor likely spent his recovery from his gun shot wounds at Carthage in that cabin. Along with his duties as an Apostle, John Taylor also worked as publisher for two local newspapers and sat on the city council. The Gardo House was originally commissioned by Brigham Young, but wasn't finished during his lifetime. It was intended to be the official home of the president of church, where he could administer over church business, hold counsels, host dignitaries and government officials, hold social events and other functions. When the Gardo House was completed, President John Taylor reluctantly moved into the home after a unanimous vote from the church members for its use at General Conference. Church members viewed the house as a symbol of the success and prosperity they built up from nothing in Salt Lake. However he only lived there for 2 months before he went into hiding. President Woodruff was the first to use it as a residence and for church offices for an extended period of time. However, the U.S. Government seized all church property and started charging punitive rent and taxes for the use of church buildings, temples and the Gardo House. After a while the church leadership determined the house wasn't worth the cost so they sold it to private owners. It remained in private ownership until the government purchased it to use as a federal reserve bank. 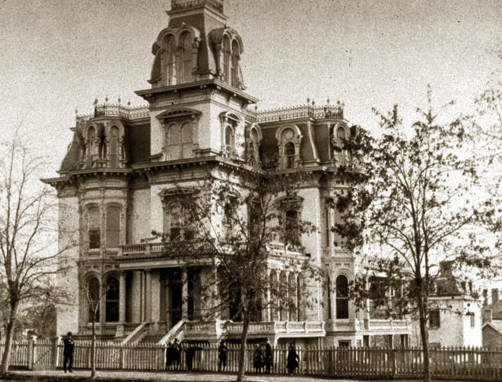 The Gardo House was demolished in 1921. 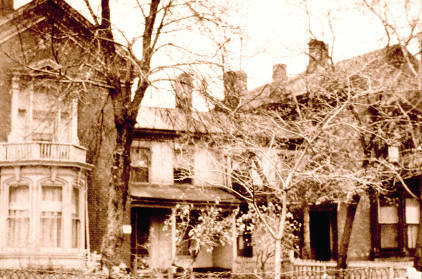 Six of John Taylor's families lived in a row of houses known as "Taylor Row". The picture above shows two of the houses that comprised the row. John Taylor didn't spend much time living in any of his houses. He spent the last years of his life, and most of his presidency, evading capture by federal troops and marshals for practicing plural marriage. John Taylor died in 1887 while staying at the farmhouse of Ben Rouche in Kaysville, Utah. 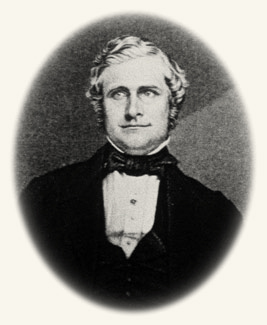 John Taylor's presidency is noted for canonizing The Pearl of Great Price, leading the church while in seclusion for polygamy, dedicating the Logan Temple and organizing the primary organization for the children of the church.